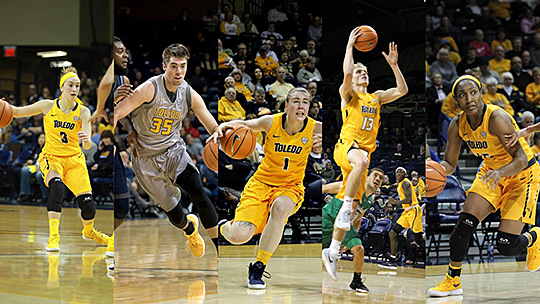 The Toledo men’s and women’s basketball programs will both hold open practice sessions in Savage Arena Saturday, Oct. 6, as a part of UT’s 2018 Homecoming events. Women’s hoops will start the day with a 7:30 to 9:30 a.m. session. Men’s practice will be from 12:30 to 2 p.m. following the 10:30 a.m. Edward C. and Helen G. Schmakel Homecoming Parade. Head Coaches Tod Kowalczyk and Tricia Cullop will sport microphones for their respective teams’ practice. The women’s practice session will feature free bagels and coffee, and tours of the facility will be available afterward. The men’s session will have free pizza and soda, along with another opportunity for fans to tour the facility following practice. Fans planning to attend are encouraged to use parking lots 1 and 2, along with the East Parking Garage. Normal game-day parking rules apply. Opening tipoff is right around the corner with the teams hosting an exhibition doubleheader Saturday, Nov. 3. The women will play Findlay at noon, while the men take on Hillsdale at 2:30 p.m. Season tickets can be purchased at the UT Athletic Ticket Office in Savage Arena, online at utrockets.com, and by calling 419.530.GOLD (4653). This entry was posted on Thursday, October 4th, 2018 at 3:11 am and is filed under Alumni, Athletics, Events .